I have long been interested in the story of Easter Island (Rapa Nui). For those unfamiliar with the story and history of Rapa Nui, it is worth looking into for the sheer wonder/horror that it represents. It is truly another version of a paradise lost. In a nutshell, Easter Island is an isolated island in the Pacific which was originally settled by humans about 1500 years ago. It is located thousands of miles from any other inhabited place, so once discovered, the island was pretty much the center and extent of the earth to its inhabitants. A comparison could be made to another small dot in the middle of a vast, inhospitable space - the earth. 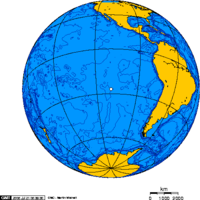 The people of Rapa Nui quickly came to believe that they were the only people on earth and that the island was all there was to earth. The population never exceeded a few thousand people, but for an island 15 miles by 7 miles, this was plenty. The island was very rich when found, forested and with great resources. The people thrived at first and developed a class based society built around the worship of the ancients. This resulted in the iconic statues that Easter Island is known for. There have been a total of 887 Moai found on Easter Island. Most were either never completed or never transported to their intended destinations. About a quarter were. These were placed along the shore areas around the entire island and placed on rock stands called Ahu. The statues always face inland with there backs to the sea. What this meant you could speculate on for days. 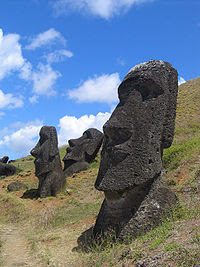 Many of the statues are still located in the central island quarries in various stages of completion, some still embedded in the rock. The civilization that built these statues apparently collapsed at once. At the time of European discovery in the early 18th century, the society had descended into a decentralized mess with pretty savage customs. The island was now treeless and only limited agriculture took place on the rich, but eroded volcanic soils. (The scene in the movie where they chop down the last tree - "Someone has to chop it down. It might as well be me" - is horrifying) With the trees gone, so was all chance at building canoes or boats, houses or towns. All were instantly poorer and with a much bleaker future. So many options and choices instantly disappeared The religion was the "Birdman" cult described in the movie "Rapa Nui" (available on Netflix instant viewing). Modern parallels can quickly be seen. Maybe the comparisons are too simplistic, but here go a few. We like the Rapa Nui, too often see ourselves as the center of the universe and its only purpose. We are also surrounded by an unfathomably large amount of space, separating us from any other possible explanations as to how we fit into the universe or our place in the bigger picture. We also, even though we conceptually see that the only thing we have is our island, seem intent on degrading or destroying her. She is our lifeboat, yet we seem to be chopping holes in her hull and cutting down her masts as quickly as we are able. The main difference seems to be only one of scale, not one of material difference in our eventual course or intentions. We also seem organically bound to divide ourselves into classes or groups based on arbitrary assigned differences like skin color or language or birth place. The Rapa Nui divided themselves into a ruling class (the long ears) and a labor (slave) class (the short ears). And the only thing that kept the society functioning was this system. When it fell apart, society degraded into chaos. This says something about who we are and I don't think it is too nice. In my perfect world, we could see these parallels and the dangers and ultimate destinations that these comparisons would lead us to believe we are heading. But we can easily see what we are doing to our home. And we can easily see the eventual outcome. And we have always consistently chosen to pretend that it isn't so. The end of this story is already written. And we will not make any changes until changes will not matter. Just like the Rapa Nui. "One generation plants the trees, the next gets the shade"
I just have spent the last two days planting longleaf pines.?? It does require a bit of an act of faith to put time, energy and money into something that you know you will never reap the benefits of.?? We all stand on the shoulders of those who come before us.?? I have lived in the shade provided by my parents, grandparents and beyound my whole life.?? I sincerely hope that my own children live in a cool and shady place! The brain vs the heart? Where is the soul really at? Its Saturday morning and what looks to be the beginning of a beautiful day through the windows of my sunroom. I don't blog about work much, but today some reflections are running around in my head. Tim works in CVT, an open-heart unit. I manage a Medical/Neuro ICU. I often do brief educational sessions on strokes. I tease in my classes about which matters most the heart or the brain. The brain is why we breathe, why we move. Its where we hold our intelligence and our memories. Its why our heart beats. Yet our brain wouldn't work without good oxygen rich blood that is pumped to the brain by the heart, so kind of like which came first the chicken or the egg. The brain tells the heart to beat, the heart beats the oxygenated blood to the brain. A broken heart (literrally not figuratively) affects the whole body and the brain. A broken brain affects the heart and the body as well. Are they equal? I guess that answer depends on who you are - a person who has strong beliefs about one's spirit and soul or if your a scientist and don't put much stock in feelings. We equate so many of our emotions with our heart - love in my heart (feeling of euphoria), a broken heart (feeling of sadness), anger in ones heart (feeling of anger and frustration). Yet in truth, these feelings and emotions are created in our brain and the actions stimulated from these emotions are again products of all the activity in our brain. The smiles, the laughter, the tears, the sadness - all comes from an area of your brain. In healthcare, when a patient has a heart attack and dies, we generally are okay with the thought that the persons spirit and soul have gone to heaven at the time the heart is no longer beating. And I think for any of us, we look for that certainty of when death is. The person is no longer breathing and the heart is no longer beating. As nurses, we are trained to assess for these two things to determine that the patient is dead. So, that certainty we are looking for, is it the time written on the death certificate? If your reading this, your wondering if I am crazy, I'm sure. But when someone is brain dead, death goes against our training because they are still breathing and the heart is still beating, although artificially. When you have a patient who is brain dead or seemingly, but it is time between brain death testing that is the hold up, so what is the time of death? When we stop the ventilator and the heart beat stops on the monitor? That is what will be written on the death certificate. Is that when we truly see the heart is no longer beating, that we have proof that ones spirit is now gone to heaven? The truth though is that when the brain no longer functions, it is artificial means that is keeping things on the monitor. So, here is a far fetched thought, we dont' get emotionally attached to machines or equipment, yet its okay to get attached to the ventilator and monitor? To summarize - if nothing else - for myself.....We need our brains to direct all the things we do and are. We need our heart to pump good oxygenated blood everywhere. Sometimes our heart (supposed emotions) and our brain (logic) do not agree. We think our heart says do something , yet our brain says don't. We have a heart attack and die, our soul goes to heaven. Our brain dies and perhaps at the point when it herniated, that is when our soul goes to heaven? As a nurse, I would think that. As a family member, I would hold out that when the heart is no longer beating on that monitor, the soul is then released. But the challenge of getting a family to understand that its just an empty body, a body that without brain functions is not compatable with life is touch. I guess we hang on to the fact that as long as the body is still warm and the heart is still functioning that the patient is still with us to touch and see. Once gone, those simple things are no longer available. As a loved one, I would want to touch that warmth and hold on as long as I could, yet if I knew that the soul was gone to heaven at an earlier point and if I knew that the body's warmth was just fake, would I get to acceptance of death sooner? Hmm? so perplexing. Death is never easy. I can't help but think though that a heart attack related death is so much easier on the family because it is so much more definitive. Brain death - not so much. Enough about this subject of death. A reality of life. A reality that nurses deal with. For this one, an emotional ride as I see the young patient, I see the clinical reality, yet the sadness and strong HOPE and faith in the wife and family. Miracles do happen, but still an internal struggle for me. Could you tell? With each child's birthday, the excitement they feel about a party, a celebration, the cake, and presents of course, is immense. The traditions of a birthday are part of what make them so fun. I'm not sure what age you get where the excitement turns to dread, but for the little ones, a birthday is a momentous occassion that signifies they getting bigger, growing older and having more significance in the world. Walker's day starts with his morning at day care. "Small birthday cakes" as he would call them, (miniature cupcakes) were shared with his friends. A choppy "happy birthday to you" was sung with some unique creations of words in the song by his "friends" at school. Dad picks him up promptly at noon. Thankfully a nap was in his plans because his demeanor was less than optimal for his upcoming party. And then the Bakugan party began. Walker's request was for a Sonic the Hedgehog cake, but that was nowhere to be found in the five stores I searched. So, Wal-Mart came through with the Bakugan theme. What is this you ask? Same question we asked at Christmas when my brother and his family provided Walker with his first red Bakugan toy or thing. Not sure what it is. From the makers of Yu-Gi-O and a similar concept to Pokemon, the round ball of plastic gets rolled. The goal is to roll over a card that has a magnet in it and the round ball becomes a creature of sorts. (there are more rules to the game and collecting points etc, but it seems much to complicated for me) But for now, this is the "in" thing and Walker seems to enjoy them. So, with Bakugan plates, cups, napkins, table cloth, blowers and face masks, the party begins. Hamburgers and Homemade Vegetable soup for the adults (this was Tim, me, Grandmother and Granddaddy and Hunter) and Hot Dogs for Walker were the birthday boys meal. We then enjoyed the birthday cake and "sprinkle" ice cream. And then, the moment he had been waiting for...the birthday presents! yippee! Guess what was in one of the gift bags? You guessed it - a Bakugan! He also added several games to his shelf - SpongeBob bingo, Gold Fish and checkers, a Bop-It game, a memory game, $4 in cash for each year from his Nana in Texas, more $ from the Grandparents and a Nerf gun ( of which Hunter actually enjoyed). Hugs and thank yous, smiles and kisses concluded his special day! His dad measured his height on the laundry room door and my how he has grown. Four years ago, Brittney was home during her winter break. She was having some friends over - Joey, Jessica and Mosha (if my memory serves me right) - we were having spaghetti. Contractions started while cooking. I had worked that day and home by 5:30pm. I remember walking around and around the island in the kitchen. With this being my 4th, Tim was not wanting to utilize his nursing skills in the area of childbirth, so we were at the hospital by midnightish. From the ED lobby into a wheelchair, then to the triage area of labor and delivery. The admission part done and a few contractions, to the room we go. Dr. Byron was not on-call that night, but Dr. Kantarowski was. Contractions continue, no pain relief in the form of an epidural until plenty of IV fluids had infused. My water was broke by the MD, the contractions become ever so present, the IV fluids continue. Finally, the anaesthiseologist was called. I believe his took his sweet time in getting to our room about 20 minutes after the call and as it turned out, to no avail. A turn on my side for the procedure of the epidural, then the pressure, a flip back to my back, a call to the MD, the nurse saying "do not push yet, the MD is not here" - as if I could control the natural occurrence of things! At around 3:15 that morning, Walker came into the world! Tim was quick to follow him as he was checked out and cleaned up. Four years later we have a blonde hair, blue-eyed, affectionate, happy boy! He is adored by his three siblings and continues to keep Tim and I feeling young....most days. One of my hopes every holiday season is to create and bake some goodies. The family and I usually work in some time to bake or create something simple and share with our family and friends that live down our road and have a special place in our hearts. That amount is too many to count for those in our hearts, but for our holiday delivery we usually see about 8 homes. Tim has a new creation each year and this year it is GingerBread Cake . I believe we are now at his third completion. Tomorrow morning will be the Fresh Hot Apple Pies. Mmmmm! The interesting story this evening however, is the fact we were both cooking in the kitchen at the same time. We usually give each other plenty of space and time between creation, but tonight, well, we had fun. We determined that we didn't do a good job communicating, even when in the same tiny space, specifically regarding who needed the oven and for how long. And then we had Chocolate chip mishaps. Oh my! I used the last bag. He had his eye on them. So.....off to Wally world he went. Did I mention it was 10PM at night? He had everything mixed for his Congo squares. (Another new item this year.) Our plan is to put the finishing touches on our creations and the family will pile into the van and make deliveries tomorrow! The goodies may not be perfect, but the love, fun and thought that is going into each special treat is 100% guaranteed.